This stunning lakeside villa is ideally located, just 15 minutes from Disney and close to all the major atractions Florida has to offer. With four bedrooms and 3 bathrooms providing accomodation for up to 10 people in space and comfort. The South facing pool deck has sun all day long with views over the lake, ideal for lazing by the pool whilst watching the eagles soar overhead. 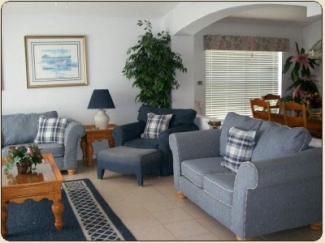 Tastefully decorated throughout with high quality furnishings and fabrics. 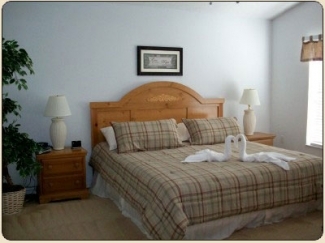 Equiped with wireless broadband, TV in the lounge and bedrooms, DVD player, Playstation. Telephone with free international calls. The villa is fully equipped with everything you will need for the perfect vacation including an ice cube maker, towels and laundry facilities. This is a wonderful villa with space enough for two families sharing. Just minutes away from Walmart and a huge choice of restaurants to meet every taste. Our Florida home is professionally managed and maintained to the highest standard with 24/7 access to our management company. The attention to detail and the suburb location is the reason our guests come back again. All rates include 13% Florida tax and final cleaning all linens and towels, utilities and pool maintenance. Pool heating extra. Day rates from �75 depending on season. Special offers on late availabillity please contact us. Discounts for long stays over 3 weeks. Booking deposit �200 for 2 week bookings, �300 for 3 weeks or more.